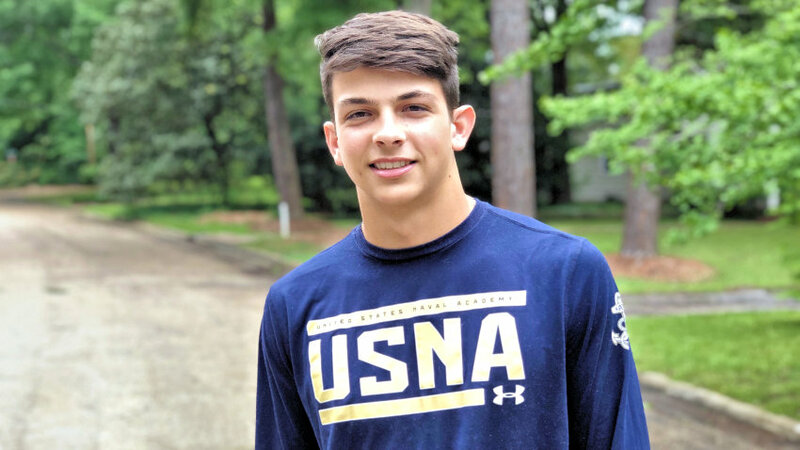 St. Andrew’s Episcopal School senior and Fondrenite Charlie Sewell is ready for his “Plebe” Summer at the United States Naval Academy in Annapolis, Maryland. Sewell is one of four seniors from St. Andrew’s accepted to one of the nation’s prestigious military academies, a four-year educational opportunity and commitment to military service, worth hundreds of thousands of dollars. He found out in March during school track team workouts. That is when a drink of water turned into a celebration. “My dad had been bugging me about setting up my voicemail,” Sewell recounted, knowing a call was hopefully coming soon. Phone calls to friends followed. So did a visit to John, his father, at his office at Millsaps College. Finding out after months of waiting was, in a word, relief. Military service had been Sewell’s plan, especially after his days at Murrah High School. It was during his sophomore year that he participated in the school’s JROTC program. But Academy Day, held annually at Madison Central to spotlight the Army, Navy and Air Force academies, piqued Sewell’s interest. That led to his attending the Naval Academy’s weeklong Summer Seminar in Annapolis between his junior and senior year. During his high school years, Sewell maintained a 3.9 GPA. He is the captain of the St. Andrew’s football and track teams, Prefect of the school’s student missions team and a part of the student alumni team. At Murrah, Sewell was inducted into the National Honor Society, played football and baseball, ran track and was on the swim team. While academics play a major role (he will pursue a S.T.E.M. related field of study), Sewell understands the Academy requires a great deal of physical and mental endurance. He recalled an instance during the summer seminar last year where he hadn’t exactly fallen in line. Sewell’s induction day, or I Day, is June 27. His father said the plane tickets for the whole family have already been purchased. Charlie will get about 45 minutes with his family following a swearing-in ceremony. And then, it’s goodbye to John, Kim, his brother Jack and his sister Maggie. For those next seven weeks, Charlie will only be allowed three Sunday afternoons in July and August for thirty-minute call windows. John said they’ve joined a parents’ group on Facebook to connect with others who are going through the same thing. Charlie said he’ll miss the little things about his civilian life. How does Charlie know he’ll be successful? “I take orders well,” he said confidently. His father burst into laughter. Sewell is the first student at St. Andrew’s since Price Chadwick (2000) to be accepted to the Naval Academy.